Taysom Hill, born Taysom Shawn Hill, is a football star who joined the National Football League (NFL) in the year 2017. But before then, the quarterback player represented Highland High School as well as the Brigham Young University in college football competitions. You’ll get to know more about him in this piece. Taysom Hill’s mother gave birth to him on 23rd August 1990, in the United States of America, precisely in Pocatello, Idaho, which doubles as the place he was raised. The names of his parents are Doug Hill (father) and Natalie Hill (mother). Hill also has three other siblings whose names are Jordan Hill (brother), Dexter Hill (brother) and Celeste Hill (sister). Born on May 17, 1984, Dexter passed away in March 2016, forcing the NFL star to forego Brigham Young University’s end-of-spring activities. Dexter, who died at the age of 31 in his Idaho home was Taysom’s mentor. He played for Pocatello Highland High as a quarterback and was outstanding during his active years. He also represented Scottsdale (Arizona) Community College and also threw for 19 touchdowns and 2,300 yards with nine interceptions in the year 2004. Taysom Hill attended Highland High School, where he joined the school’s basketball and football teams. He also participated in track and eventually graduated in 2009 with good grades. In his senior year, he rushed for 1,491 yards, threw for 2,269 yards and 18 touchdowns, and rushed for 24 touchdowns as well. This impressive result earned him several awards at the time, which include – All-Conference Player of the Year accolades, Gatorade High School Player of the Year, the All-Idaho Player of the Year, and First Team All-State selection. Hill also boasts an exceptional record in track and field. He participated in long jump and 200 meters race. He also represented his school in the 5A District IV/V/VI Regional Meet which held in 2007. At the competition, he took the third place after recording a personal-best time of 22.5 seconds in the 200-meter race. In his senior year, at the 2009 5A Regional Meet, he emerged as the winner of the long jump event with a mark of 6.85 meters. Upon graduation in 2009, Hills received admission offers from Brigham Young University, University of Arizona, University of Utah, Boise State University, Stanford University, Washington State University, and Oregon State University. He finally decided to join Stanford but later enrolled Brigham Young after a while. The NFL player entered as a starting quarterback in the 2013 season. He also recorded a 19–16 loss at Virginia in the season opener, he, however, made a comeback in a game against Texas the following week, recording three touchdowns and 259 yards rushing in a 40–21 win. Hill went into the 2014 season with high hopes but ended sustaining a fractured leg in a game against Utah State. During the 2015 season opener, Hill also sustained a Lisfranc fracture, which caused him to retire before the end of the season. 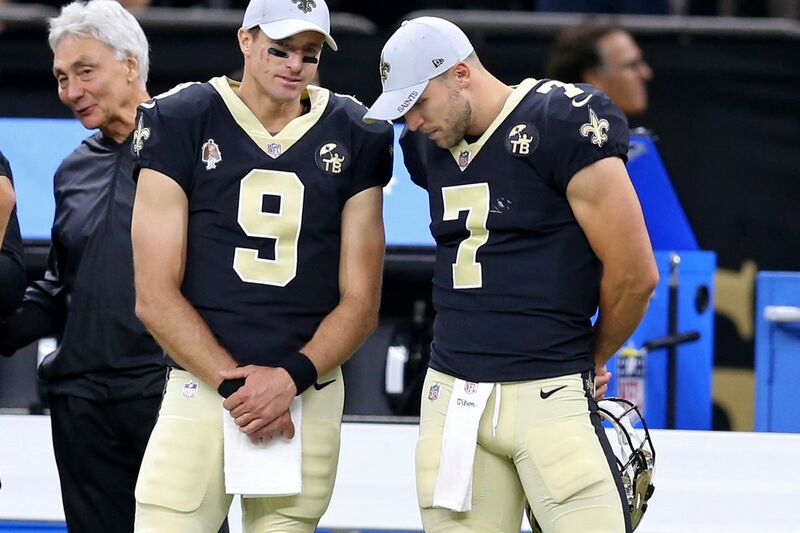 Towards the middle of the 2016 season, Taysom made changes to his jersey, changing the number from 4 to 7 in honor of his older brother Dexter, who passed away earlier in the same year. Prior to his death, Dexter wore No. 7 as a football player. Speaking of his professional career, the footballer failed to join the 2017 NFL Draft class but was later signed as a free agent by the Green Bay Packers on May 5, 2017. He went on to represent the team in 3 preseason games, throwing for 2 touchdowns and finishing 14 of 20 passes. Hill currently plays for New Orleans Saints as a quarterback, following his promotion to the active roster on December 3, 2017. Hill has a happy family, which comprises of himself and his beautiful wife for now. It appears the couple has not given birth to their own children as there is no information about their kids. The football player’s sweetheart is none other than Emily Nixon. They got engaged in 2013 when Hill proposed to her in her hometown of College Station, Texas. Nixon confirmed her engagement to the football star on her Twitter and Instagram accounts, after which Taysom also shared the good news with his fans on his Twitter account. It is generally believed that the body composition of every football player is very important to the development of his career and Taysom Hill is lucky to have a well-structured body frame that has been of help since he began to play organized football. The New Orleans Saints stands at a height of 6 feet 2 inches, which is the same as 1.88 in metric units. His body weight is measured at 100 kilograms or 221 lbs in pounds.